14K white Diamond Feather Design Ring,1.000ctdiamonds. The light and airy design of this ring will enrapture you. Crafted in 14K gold, this ring features a wide, flat, polished white gold band. Accenting it is a white gold feather design along the front top. 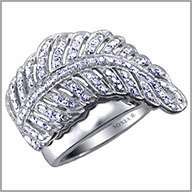 There is a total of 100 round cut diamonds bead set throughout the feather. Total diamond weight is approximately 1.000ct and the setting size is 1" x 7/8". This ring is very classy and the workmanship is top notch as with all of Sonia's designs. Classic in design, heavy gold, wears and fits well on the finger, and the diamonds sparkle. Not what I call "rock salt" diamonds on any of Sonia's pieces. They are the quality as stated and more. I receive a lot of compliments when I wear this ring. 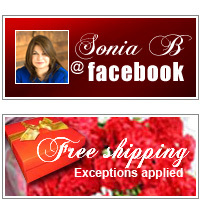 As always Sonia I enjoy this ring as well as all of my others that I have purchased from you....You are the best!